Summer is a time for kids to run wild and explore—a time to play, sprint, create, take chances, learn, and grow. Some kids want to spend their summers playing ball; others want to spend them in the art studio. At Tyler’s Camp, kids get a chance to do it all. 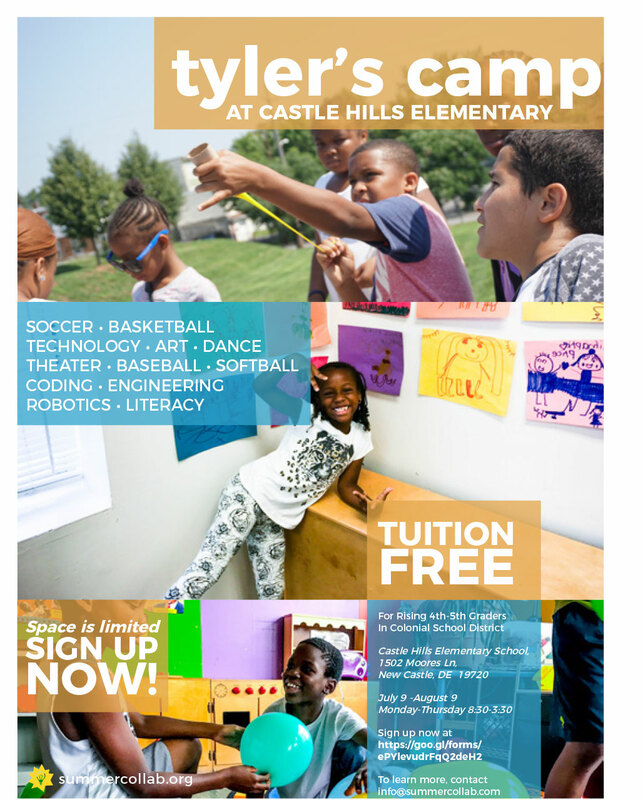 Tyler’s Camp at Castle Hills Elementary is SummerCollab’s four-week-long academy for the Colonial School District’s students, grades 4-5. Campers will take on a range of activities, courses, and projects across disciplines. And what’s more is that campers get to choose their pursuits, which might include everything from basketball, field hockey, and soccer to painting, dance, and percussion. During their summer at Tyler’s Camp at Castle Hills, kids will experience programming that responds to their interests, their academic growth, and their personal growth. Tyler’s Camp has partnered with a team of expert educators, including STRIVE to create a diverse community of leaders to support campers throughout the summer.